NieR:Automata is worth your time and money. Play it. Become as gods. Several thousand years after the events of the original NieR, Automata introduces us to a war between machine lifeforms and androids fighting for the sake of humanity. 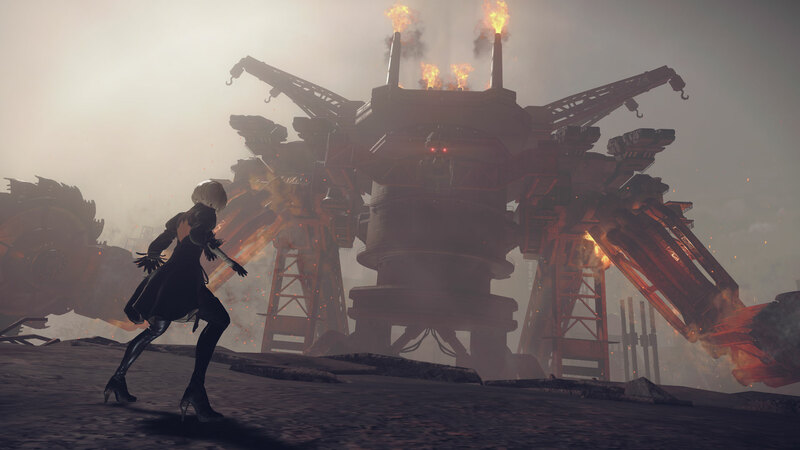 2B and 9S, two androids of the YoRHa combat unit, begin to explore the ruins of a city in order to learn more about the machines and find a way to stop them. While the end goal is allowing the remnants of humanity to retake the planet, many arduous challenges stand in the way. While a sequel, knowledge of the first game is not necessary. 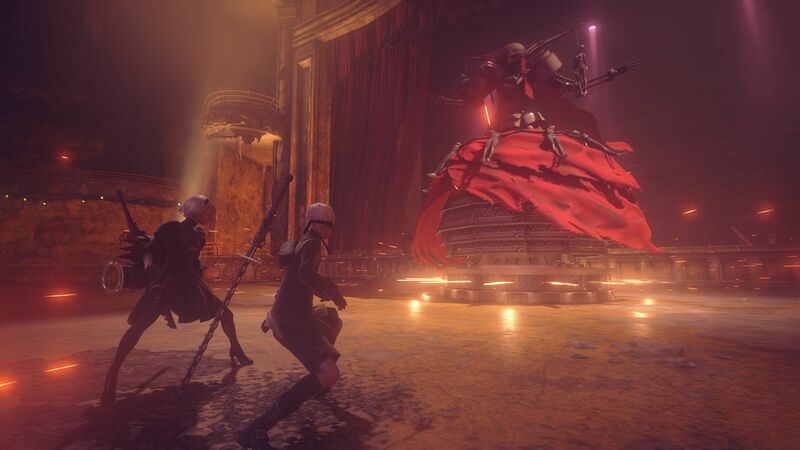 The story takes place long after the events of the original, and those events have no direct bearing on the present conflict of Automata, only acting as backstory where specific details mostly don’t matter. However, even for that purpose it is explained as fully as necessary within this game. 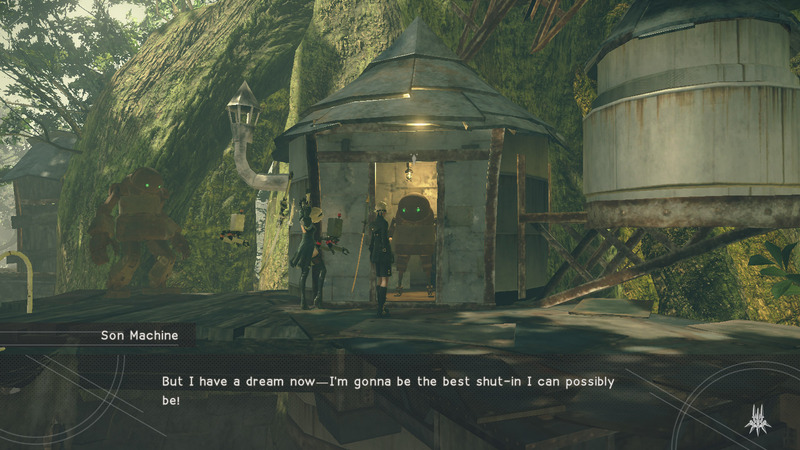 The story is easily one of Automata’s strongest points. Within the first mission, it sets up the roots for many of the overarching themes. How these develop through the story, along with the general progression and how twists and details are presented, always leads to interesting returns. Technically, there are 26 different endings, one for each letter of the alphabet, but only A through E are proper conclusions. Playing through the A route opens the B route, which then opens C, D, and E routes. The other 21 endings are mostly jokes that result from foregoing critical objectives or doing silly things. One example – each android has an OS chip that bears the warning, “Removal means death.” Guess what happens when you remove it? The greatest strength of the story is that it is simultaneously effective at grabbing your heart at full-force and refusing to relent, while also being more subtle when appropriate. This isn’t the type of game to line up throwaway characters you’re expected to care about – when something happens, there is weight and buildup to it. Especially where the main characters are concerned, their pains and conflicts reflect readily to the player, adding greater tension and focus on the stakes of the story. Along with this, while the characters clearly observe and internalize what they see through the course of the game, they don’t always spell out their opinions on everything. Rather, their reactions to events and NPCs, particularly in how they stray from the paths of others, show that they haven’t been passively watching the story pass them by. Led by androids 2B and 9S, the characters are far more human than their mechanical innards could lead you to believe. While 2B plays the part of a cool android, going so far as to say, “Emotions aren’t allowed,” her feelings of happiness or despondence are made clear. Beyond 2B and the other main characters, many others play interesting roles in the story, developing along their own paths as everything unfolds. It’s very easy to grow attached as you see how they grow in the world around them, making the characters’ suffering feel like a personal punch in the player’s gut. The overall world design is a good combination of open-world and focused exploration. 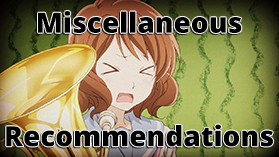 For the main story, getting to and from everything is rather straightforward and doesn’t feel too repetitive. However, the side quests, of which there are plenty, require retreading the same ground over and over again. The map size seems fine at first, but once you’re 40 hours in it feels quite inadequate. The side missions themselves are at least mostly worth the time. While most don’t necessarily offer anything interesting in terms of gameplay, they do plenty to flesh out the world and the opposing factions, while also forging stronger bonds between characters. The best examples are the requests directly from 2B and 9S’s YoRHa operators, who are trying to see more of earth through the main characters. 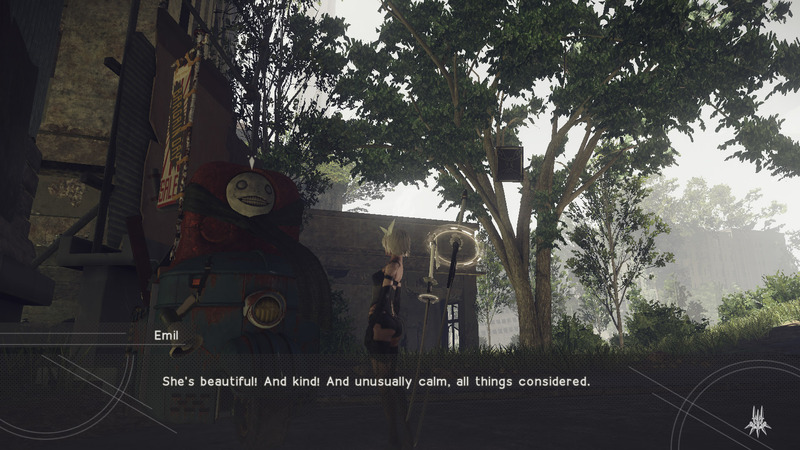 As with its predecessors, Automata is an action RPG. However, it is a huge step up in nearly all regards of gameplay. Moving the characters feels extremely fluid in both controls and their movement on-screen, combat is always satisfying, and it never gets stale. The majority of the combat is done by controlling the main character directly and attacking with melee weapons and the ranged POD, but there are also hacking minigames and flight sections. The only major issues come from forced perspective changes – sometimes, the game will force the player into a 2D side-scrolling or top-down perspective, which feels very limiting compared to the normal ease of movement. While there are four weapon types (small swords, large swords, spears, and fists/combat bracers), there’s never too much of a reason to change your arsenal around. Different weapons have different passive effects once fully upgraded, but their damage ranges are comparable, meaning it is very easy to play through the game without worrying about it. There are plenty of other ways to customize a bit more freely. Along with melee weapon upgrades, another tool at the player’s disposal is the POD. Acting as support units for member of YoRHa, these PODs each have a default ranged attack and a customizable stronger one – these include a laser, singularity, hammer, and more. Particularly once all three PODs have been obtained, they offer more flexibility as ranged options. They can also be used to zone into enemies that are out of melee range, which is often extremely helpful. The most substantial means of customization is the plug-in chip set. With this, the player has a limited number of slots to install plug-ins for HUD elements, damage or speed boosts, automatic healing, and much more. Each chip takes up a certain number of slots, with more powerful ones generally taking up more space. As you unlock more slots and obtain more varied chips, these become an excellent way to maximize effectiveness and tailor things to your play style. I regularly swapped between two sets, with one focused on battles and the other on general exploration. Beyond the story and gameplay, the rest of the game holds up very well. While not the most visually impressive game, it is certainly solid. Characters and environments look good and move smoothly, and effects make battles pop on the screen. Outside of a few inconsistent visual glitches and the occasional weird facial animation (particularly for male characters), the game looks and performs great. The character designs are also striking, especially if you self-destruct or angle the character a certain way. Most of the enemies have the same root to their designs (which has an interesting explanation behind it), but you continue to see different adaptations to this based on location, alignment, and general strength. The world can also look a bit monotone, but moving from one area to the next offers an adequate amount of variety. The music, voice acting, and general sound design are all fantastic. The music acts as an effective backdrop while exploring the world, and also a powerful and emotional accentuation for battles and plot events. One of the highlights is the first variation of Birth of a Wish – the frazzled machines’ mantra “This cannot continue” is warped into the song and repeated as a sort of primal chant. As far as the soundtrack is concerned, there are no low points. The English voice-acting is great, with each voice both appropriate to the character and authentic. The only issues come from awkward facial animations or poor lip-syncing, which cause a bit of disconnect. However, the overall sound design more than makes up for this. Volume and tone adapt naturally based on distance and position relative to the camera, music transitions cleanly from one track to the next, and everything about the environment sounds very real. The most unique example is the final credits of the E ending. Rather than a single song playing straight from beginning to end, there are about twenty base parts. It always starts and ends the same way, but the flow of the middle adapts based on your progress. Once it finally reaches the conclusion, which is actually sung by many of the developers, it feels like the perfect cap on the player’s journey. Few games accomplish what NieR:Automata does. It is a thoroughly fun game. Its story and characters pull the player in, getting them emotionally invested and offering no recourse. The graphics strengthen the world design and add plenty of flair to smooth combat. The sound design offers a realistic aural landscape, while the music bolsters every single event of the game. After suffering, turbulence, and confusion, the final ending of the game left me content. The original NieR was an enjoyable game marred by flaws in all directions. Automata cleans up the mess and maintains very few low points. It’s a game that succeeds on all fronts. Just make sure to keep playing after ending A. 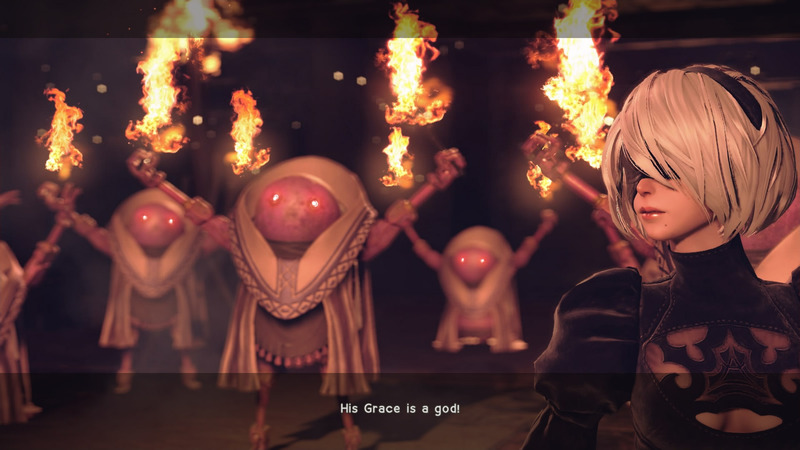 The message from “Square Enix PR” felt poorly worded and missed the point of what they were trying to say – ending A is not even remotely the end and you’re supposed to keep playing. It would have been better if it just bumped you into the B route immediately. Oh well. Aw yeah, I NEED to play this game. I’ve been into the NieR series for a while now, though I’ve only watched cut-scenes and other people play it. Also the soundtracks are amazing. Unfortunately, I didn’t pre-order (or get a physical copy), so I couldn’t get that t-shirt. Sad. But yes, definitely play the game.